Feeling good about some recent successes? If so, this might be a good time to pay heed to Heraclitus, the ancient Greek philosopher who lived around 500 BC. 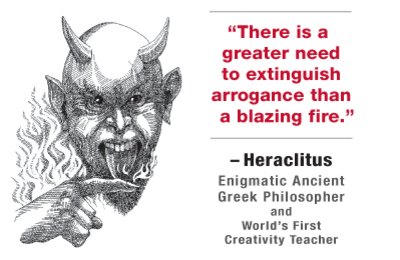 Today's Heraclitus insight (from the Innovative Whack Pack) is: "There is a greater need to extinguish arrogance than a blazing fire." There's a creativity strategy in this epigram, and I believe it is: "You are not God." The ancient Greek word for arrogance is hubris, and it was seen as a precursor to one's downfall. Anyone proud enough to challenge the gods would be burned by the gods. If you're repeatedly successful, there's a tendency to believe that you have found the formula for success and are no longer subject to human fallibility. This is devastating to the creative process. In a world that is continually changing, every right idea or strategy eventually becomes the wrong one. With an arrogant attitude, you cease paying attention to differing viewpoints. You screen out the "boos" and amplify the "hurrahs." You believe that you aren't subject to the same constraints as others. For example, shortly before the Chernobyl nuclear reactor melted down and exploded, its engineering team (comprised of respected experts) won a distinguished award for operations productivity. The team felt that the safety rules they were asked to follow were designed much too narrowly for such an experienced group, and so they disregarded them during their reactor experiments. The result was a great catastrophe, with considerable loss of human life and potential genetic damage to future generations. Think of all the businesses that were so sure of their products and methods that they stopped listening to their customers, and soon found themselves without any. Indeed, arrogance can infect entire cultures. The Chinese were extremely confident of their ways shortly before they were conquered by the Mongols. The same could be said about the Aztecs and the Incas prior to the arrival of the Spanish. Do you have a current problem or issue you're dealing with? Then ask yourself these three questions: "How is ego adversely affecting my judgment? Where have I been successful in the past when dealing with a similar issue? Has this success made me less receptive to alternative approaches? Know how you can tell is someone has an issue with ego? They'll tell you they don't have one. But I also believe that ego is one of the true enemies to creativity. So I do my best to control it and put that ego-energy into more productive places. I think your point about judgment is key. When egos go unchecked, that's when poor decisions get made. Oh my goodness. I've never had so much success, even in this many years that I could come near thinking that the next failure wasn't a close one. Arrogance is a word I don't cotton or have room for. That was sarcasm, for anyone currently scowling at me. "Has this success made me less receptive to alternative approaches?" Cynthia Barton Rabe refers to this as ExpertThink - one of the major innovation killers on the planet today - in her book the Innovation Killers. BTW Roger the Ball of Whacks freakin' rocks! I am totally addicted to fiddling with them, and I've got some marketing ideas for it that I'll share on the Garden next week. Wow, this is very interesting.I am attempting to get a painting authenticated and there is a very arrogant and none objective person in the way. He feels that his eyes are better than any scientific instrument and is very stubborn...i think the Greek Word Hubris is upon him as he is as wrong as alien pictures on paper dollars!